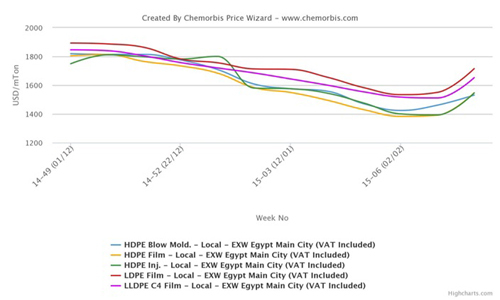 In Egypt, the local PE market levels moved up significantly as prices recorded up to EGP1800/ton ($236/ton) increases during this past week as per ChemOrbis pricing service. These hefty hikes mostly occurred after the middle of last week while tight supplies, especially for locally held Middle Eastern cargoes, and currency issues played a role in the firming trend. 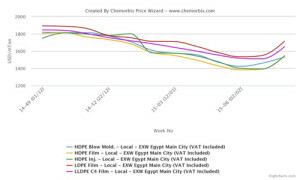 To track weekly developments in Egypt’s PE market, please see Egypt PE Polymer Digest (For members only) During this past week, locally held LDPE film prices gained EGP700-1000/ton ($92-131/ton), LLDPE and HDPE film moved up by EGP400-1600/ton ($53-210/ton), HDPE injection increased by EGP900-1800/ton ($118-236/ton) while HDPE blow moulding offers recorded up to EGP700/ton ($92/ton) hikes on the week. The increases snowballed towards the end of the week. Most players, feeling unsure of the Egyptian Central Bank’s policies and therefore, the future trend of the EGP/USD parity, turned to the local market to meet their needs. The delays seen on some Middle Eastern cargoes coupled with firmer expectations for March import prices also caused buyers to return to the local market. This situation worsened the already tight locally held supplies. Players have been refraining from making fresh import purchases for a long time given the previous large decreases that the import Middle Eastern prices were recording. Plus, the Egyptian pound has been depreciating against the US dollar as a result of the Central Bank’s policies to curb the black market in the country. This was another factor that pushed Egyptian players away from the import market and paved the road to the tight local supplies. Nowadays, traders are mostly reported to be holding onto their limited stocks as they are not in a rush to sell. Apart from the tight locally held supplies, the local HDPE producer SIDPEC also was reported to deliver in limited amounts to their customers, according to ChemOrbis. “SIDPEC had delivered large amounts of HDPE to the market during the previous week but as of last week, they started to cut the quota amounts they provide to each of their customers,” a trader commented. According to a source from SIDPEC, the company sees good demand and they deliver gradually to their customers.